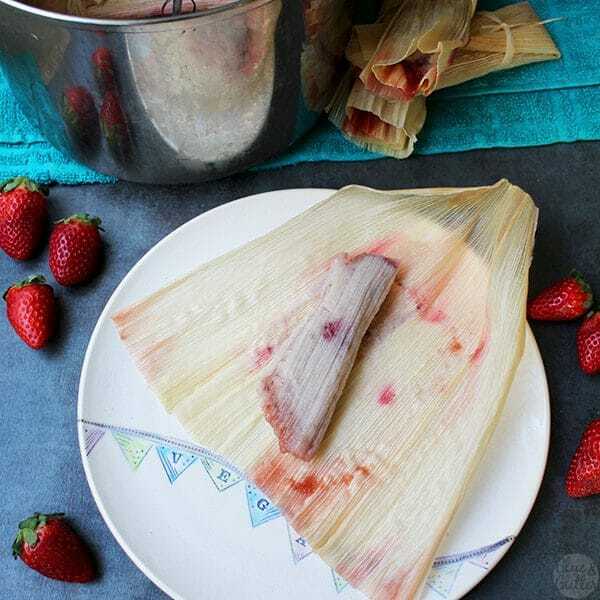 A sweet tamale might seem a little bit odd, but these strawberry tamales are going to change some hearts and minds! They’re light, sweet, fruity and perfect for breakfast or dessert. 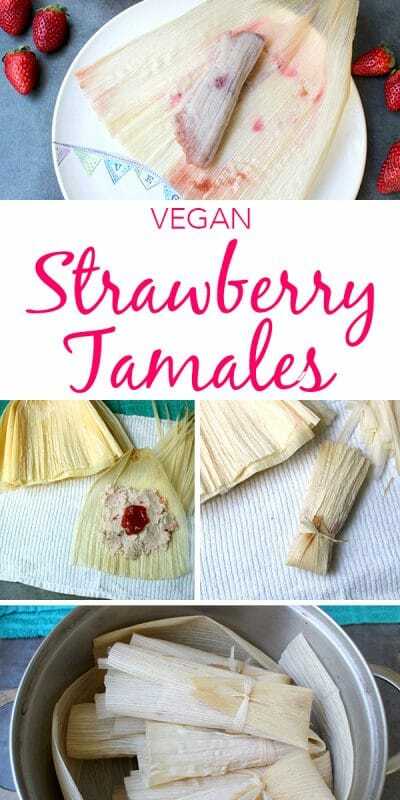 This recipe for strawberry tamales is from Dora Stone’s cookbook Vegan Tamales Unwrapped. The book is packed with recipes for both sweet and savory tamales, and she does a really great job of making the tamale-making process accessible. Tamales aren’t my typical kind of from-scratch food to make. They are not quick, but they’re easier to make than you’d think. The hardest part is finding the ingredients. If your local grocery store doesn’t carry masa harina (used to make the tamale dough) or corn husks (the outer wrappers), you can find both online. I was able to find masa harina at my local grocery store, but the employee I asked about corn husks thought that I was just over-explaining corn tortillas. The book walks you through how to make the dough, how to wrap your tamales, and how to steam them correctly including helpful step-by-step photos for all parts of the process. Once you have the technique down, you’re ready to wrap! All of the tamales in this book look and sound amazing, and now that I have a guide to making the perfect dough, wrapping like a pro, and steaming properly, I am totally going to make tamales part of my family’s food routine! Strawberry tamales, all wrapped up and ready to steam! Making tamales is time-consuming, so I did a little research to see whether I could do any of the steps in advance. It turns out that you can make the dough up to two days before you plan to cook, and you can keep uncooked tamales for up to two days in the fridge. Our Everyday Life has instructions for storing both pre-made dough and uncooked tamales, and I used her directions to store my strawberry tamale dough. I make it the night before to cut some time off of my day-of cooking needs. It worked like a charm! 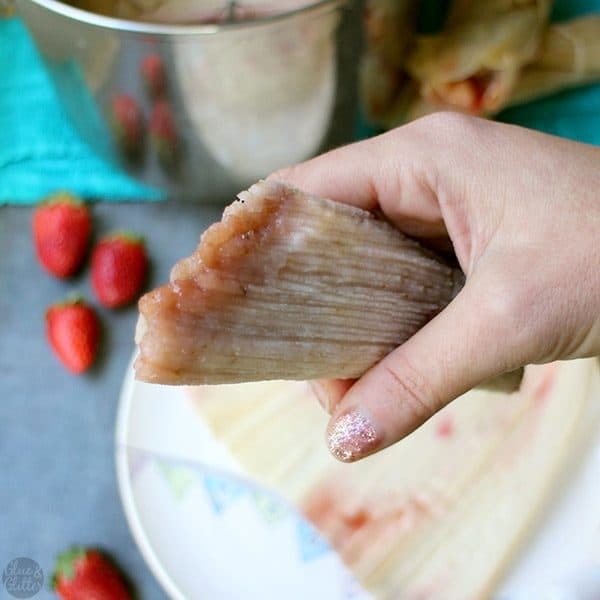 I made the dough for these strawberry tamales the night before and refrigerated it in a glass container with an air-tight lid, like Our Everyday Life suggested, and re-beat it the next day. It had thickened up considerably in the fridge, which she said would happen. I only made a half recipe, because I didn’t think my family would be able to eat two dozen tamales before they went bad (that was before I tasted one!). For a half recipe, it took me 1/2 cup of water to get the dough nice and soft again. I’d add water by the 1/4 cup, beating with your electric hand mixer in between each addition, until you get the consistency you want. You want the dough to be spreadable but not pourable. Honestly, I’m not sure I saved much day-of cooking time by making the dough ahead, since you have plenty of time to make the dough while the corn husks are soaking. Next time, I’m going to assemble the tamales the night before, so all I have to do on the day is steam them. That would have been a real time-saver! The dough for these tamales is insanely delicious, even before steaming. My three-year-old son was hanging out while I made it, and he licked the beaters AND the bowl. Then asked for more raw dough to eat. I’m definitely going to be making these again soon! 4 cups masa harina - 1 lb. 2 oz. 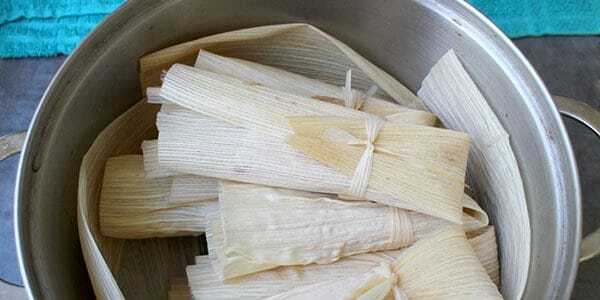 To wrap the tamales, pull 24 pencil thin strips off of the corn husks and set aside. Take a husk and dry off the excess water on it with a paper towel. Place the husk in your hand with the tapered side away from you and the smooth side up. Using a spoon, spread 2-3 tbsp. of the dough (¼ inch thick) onto the corn husk, forming a 3 - 4 inch square. Leave a border of at least 3/4 inch on each side of the square. Chef's Note: If you would like to make these with fresh masa, replace the masa harina with 2 lbs. of fresh masa and use only 1 cup of almond milk. To substitute the fat you can use 8 oz. of coconut oil. For tamales without fat, substitute with 8 oz of cooked, unsweetened pumpkin. 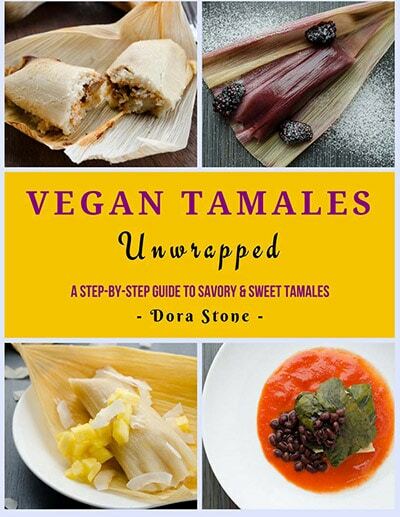 Reprinted from Vegan Tamales Unwrapped by Dora Stone with permission. This recipe is going to be so much fun to make. Thanks! Wow! I’ve never had a sweet tamale before, but I’m totally intrigued!!! I could see the corn totally working with a sweet filling! It really does! My friend took some of them home and said they tasted like strawberry cereal. I love making tamales, although I’ve never made sweet ones. This sounds so awesome. Thanks for the great idea, Becky! I absolutely love tamales! 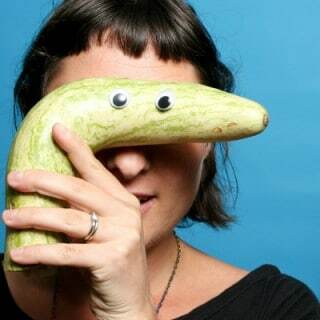 I’ve never ever seen a sweet one, I’m trying to imagine how that would taste, lol! It’s so different from what I grew up on! So different and cool. I love tamales!! But I’ve never had a sweet one. Very intrigued! But the savory ones are SO good! Sounds like an awesome book. I was intrigued, too. There are a bunch of sweet tamale recipes in the book! I love the idea of a sweet tamale and would devour these any time of day! Such a great idea. Thank you, Mel! I’m super into these. How fun! I’ve never had a sweet tamale. Thanks for the tips on how to make these in steps instead of all in one go. Tamale-making can be intimidating! It really can be. Her book breaks it down into doable parts, which I appreciated! Sweet tamales are so good! I haven’t had one since I’ve been vegan. It’s been many years! I’d never had a sweet tamale until recently. I’ve been missing out! I have this book but I haven’t tried to make anything yet. I need to remedy that soon! I made the Red Chile tamales for her book tour and just loved them but was so curious on the sweeter side of tamales. I’m glad you did this one. It looks like I’ll have to try my hand at these as well. Ooh I’ve been eyeing those red chile ones! Such a cool idea! You come up with the neatest things! These look delicious! PS – getting an airfryer for Christmas – can’t wait to try your recipes! I wish that I could take credit for this recipe – it’s from Vegan Tamales Unwrapped. The whole book is gorgeous. Definitely recommended. You are going to love your air fryer, Mary Ellen!